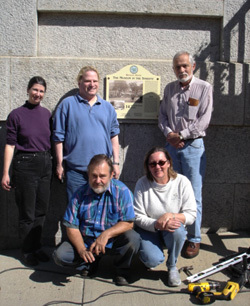 When a town or its historical society is intent on opening a Museum in the Streets©, our organization will begin guiding you through the process and answer any questions that may apply to your specific case. That would be the start of the Pre-Production Phase. A working committee is created, vintage images are collected, working copies made and a story-line developed. Your Museum in the Streets© can emphasize a particular aspect of local history or present an overview of several aspects, from architectural development to socio-economic activity. A member of the working committee is chosen to write the captions. These are limited in length and the task is straightforward. Historical facts have to be checked. Fund-raising has to begin and, when well-advanced, a letter of agreement is exchanged with The Museum in the Streets©. Payment to The Museum in the Streets© is made in thirds, upon agreement and at the end of the Production and Fabrication phases. At this point we enter Production. The chosen images are scanned, texts finalized and everything is transmitted to The Museum in the Streets© which takes over the preparation of texts for printing and the layout of the panels. Paper proofs are sent to the town for review. Fabrication starts when all corrections are made and the final print order is prepared and sent to the panel manufacturers. Five weeks later the panels are delivered to the town. The town then installs them either by fixing them to the walls of buildings or mounting them on posts which have been pre-ordered. Each town is free to select the type of post it prefers, and we leave the order up to you. 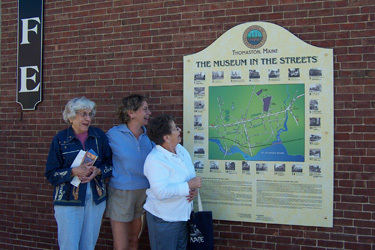 However, The Museum in the Streets© can offer guidance and connect you to prior manufacturers. The Museum in the Streets© supplies the attaching brass hardware. The Museum in the Streets© also offers advice on the production of the leaflet handed out to visitors: it is on this brochure that financial supporters of the project are given recognition. 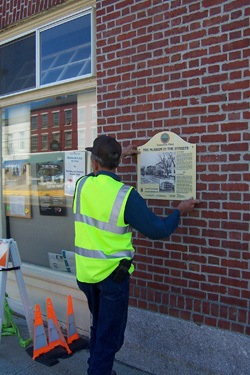 Following the installation, we suggest towns hold a formal, ribbon-cutting ceremony, to launch the installation in a way similar to any museum function. 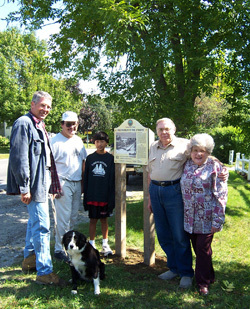 The press is invited, guided walks are organized, a reception can be hosted by a sponsor, and local supporters are recognized. It is time to celebrate! The Museum in the Streets© then includes your town and installation on its website and in its social network. The network of local historians, historical societies and common heritage expands, and our collective memory becomes richer and more diverse.